team in the Stephen Sondheim musical Merrily We Roll Along. Whether or not Sondheim meant this as a not-so-subtle dig at critics who complain his music lacks emotion, that perception has followed him throughout his career and, like a rumor, grown to the point where people who may never have seen his shows or heard his songs – or really listened to them – summarily reject them. Or else, they may have listened too well. The hallmark of a successful ballad is melody, and Sondheim’s melodies are as lyrical and haunting as any that have emerged from the musical theatre. But for a ballad to transcend its theatrical origins and reach a larger audience, the lyrics need to connect emotionally, too. When music and lyrics have been crafted for particular characters at certain moments in specific shows, the absence of that context can limit the universality of the song. Sondheim’s characters are complicated creations, and their complexity doesn’t cease simply because they start to sing. Hearing Sondheim ballads in their original setting, many find it inconceivable that anyone other than the characters they’re written for could sing them. For example, who but an actress could sing “Send In the Clowns” from A Little Night Music, with its references to making an entrance, farce, and King Lear? Well, Judy Collins made a hit recording of it. Barbra Streisand sang it, too. So did Frank Sinatra. And, divorced from its lyric, “Send In the Clowns” even became an easy-listening standard, with recordings by Liberace, Mantovani and James Galway. In fact, it has been recorded more than 100 times since its premiere in 1973. So the context of a Sondheim ballad need not impede its appreciation by a broader public. Few of the ballads in this album have achieved the same afterlife as “Send In the Clowns,” but most have found their way into other arenas, beyond cabaret and crossover to classical, jazz, and contemporary. Whether in its original setting or another context, each version has at its core a unique emotional truth that can be understood by anyone. “Send In the Clowns” is sung by actress Desirée Armfeldt, to her long-ago lover, lawyer Fredrik Egerman, upon learning that, despite her best efforts to win him back, he still is hopelessly in love with his young second wife. Cleo Laine brings a lifetime in song to this ballad of regret. Earlier in A Little Night Music, Desiree’s mother reminisces about her own well-spent youth in “Liaisons.” Hermione Gingold portrayed Madame Armfeldt on Broadway and in London, as well as in the film; her London recording is as sumptuous as the past she sings about. The veteran Broadway and cabaret star Barbara Cook had never performed a Sondheim song before being cast as Sally Durant in the concert version of Follies with the New York Philharmonic Orchestra. Bringing her peerless artistry to a part originated by Dorothy Collins, she created a three-dimensional portrait with her crystalline soprano voice. Early in the show, Sally encounters Ben Stone at a reunion of Follies girls. A former beau, Ben married instead her roommate, friend and fellow Follies alumna Phyllis. During “In Buddy’s Eyes,” Sally tries to convince Ben that she believes she married the right man. As the reunion progresses, Sally and Ben become consumed with regret for their choices, and decide to start over with each other, in “Too Many Mornings.” George Hearn portrays Ben with the right combination of bravado and desperation. The classic torch song “Losing My Mind” is Sally’s contribution to the surreal final section of Follies, a summary in song and dance of the main characters’ psychological conflicts. One of Sondheim’s most popular ballads, “Losing My Mind” has been recorded at least fifty times by, among others, Peggy Lee, Dame Edna, and the Pet Shop Boys. Evening Primrose was a 1966 television adaptation of a John Collier short story. Among the inhabitants of a department store who only come to life during closing hours is. a young lady, played by Charmian Carr, who has distant memories of the world outside, related in the ethereal “I Remember.” From Side By Side By Sondheim, David Kernan provides an equally otherworldly perspective. Anyone Can Whistle was a troubled musical with a brilliant score. Broadway was not yet ready, in 1964, to be confronted by a show that questioned not only societal standards, but musical theatre standards as well. Such complex characters as the fearless but unemotional nurse Fay Apple, who assumes an exotic French alter ego to flirt with Doctor J. Bowden Hapgood, had rarely been encountered on a musical stage. In the poignant title number Fay acknowledges her fear of emotional freedom. At the end of the show, she and Hapgood sing the duet “With So Little to Be Sure Of”; but instead of forever, it is farewell. Lee Remick and Harry Guardino were the original performers; Cleo Laine shows a hesitant optimism in “Anyone Can Whistle,” while Jerry Hadley and Carolann Page sing with an ardor that belies their conclusions. Merrily We Roll Along moves backward in time, each successive scene taking place earlier than the one before. The first time we hear “Not a Day Goes By,” Beth is singing it to composer Franklin Shepard, just before their divorce. When next we hear this affecting ballad, it is being sung by the two of them at their wedding, and by Frank’s friend Mary, expressing her unrequited love for him. Even before the show opened in 1981, Carly Simon’s recording demonstrated that “Not a Day Goes By” could transcend its surroundings, and it has since had over three dozen recordings. Bernadette Peters, from a Carnegie Hall concert, performs it as a torch song, and though the flame flickers at the finish, it is still afire. Early in the show – toward the end of the story – an older Mary, unhappy with the direction their lives have taken, rhetorically asks Frank’s lyricist Charley why everything can’t be “Like It Was.” From the Sondheim revue Putting It Together, Julie Andrews is nostalgia incarnate. Sweeney Todd possesses a score of operatic dimensions, ranging from tragic soliloquy to uproarious comedy; its ballads alone demonstrate estimable scope. In “Johanna,” young sailor Anthony Hope, upon discovering his beloved a virtual prisoner in her home, vows to rescue her. Victor Garber premiered one of Sondheim’s most passionate songs. The duet “Pretty Women” occurs at a suspenseful moment: Sweeney Todd has Judge Turpin in his barber chair, ready to dispatch him in revenge, but delays his gratification to join the jurist in song. Given a new context in Putting It Together, the number sheds its foreboding, but maintains a masculine perspective. (Barbra Streisand has recorded her own angle on “Pretty Women.”) Young Tobias, employed by Mrs. Lovett, declares his devotion in “Not While I’m Around”; but when he hints he knows of Todd’s evil doings, Mrs. Lovett realizes that with Toby around, there may be trouble. Ken Jennings and Angela Lansbury of the original cast set a memorable scene. This song has had over three dozen recordings, both as a duet (Donny Osmond and Vanessa Williams) and a solo (Perry Como and Streisand again, among many others). “No One is Alone” is a ballad shared by four characters in Into the Woods, as they realize teamwork can still make a difference, even as the rules and the rosters change. Cleo Laine made the first solo recording of this song, before the show opened. In this guise, it underscores even more strongly the need to move forward in the face of loss, a message heard only too well by some other performers who recorded “No One is Alone,” the New York City Gay Men’s Chorus. Saturday Night was to have been Sondheim’s first commercially produced musical; however, with the unexpected• death of its producer, the show was consigned to theatrical limbo for four decades. However, some of its songs emerged in concerts and revues, and one of them, “So Many People,” is among. Sondheim’s most beautiful ballads. This rendition comes from the production Marry Me a Little. There’s a great deal to sing about in Company, and much of it has to do with marriage. Bobby, the central character, is 35 years old and single. His best friends are five married couples, whom he observes and questions throughout the show. He asks Harry, who has just lost a karate match with his wife, if he is ever sorry he got married. “Sorry-Grateful” is Harry’s reply, joined by the other husbands. Stephen Collins performs it solo in Putting It Together. In Sunday in the Park with George, the 19’h century French painter, Georges Seurat, is unable to pay sufficient attention to his mistress because he has to focus on “Finishing the Hat.” The soliloquy begins with Georges flipping through his sketchbook and recalling conversational fragments• with his various subjects (human and canine), then turns to the conflicting demands of art and life. Mandy Patinkin’s rapturous account, from the original cast album, leaves no doubt about which takes priority. Assassins, a vaudeville-like survey of those who killed U.S. presidents, and some who tried. Among the latter are John Hinckley, would-be assassin of Ronald Reagan, and Lynette “Squeaky” Fromme, who failed in her attempt to kill Gerald Ford. In each case, ’twas love made them do it – Hinckley’s for Jodie Foster, Fromme’s for Charles Manson. In another context, the fierce devotion expressed in this song might be admirable; some may find it disquieting because familiar emotions are emanating from characters with whom one would not care to be so familiar. An actress of a certain age … a department store denizen … a murderous barber … a pointillist painter … a would-be assassin … people who have found happiness, who have lost it, who remember it, who seek it, who will never know it. People who, in their particulars, may have nothing to do with us, but who in song could be us. The ballads of Stephen Sondheim are for us all. 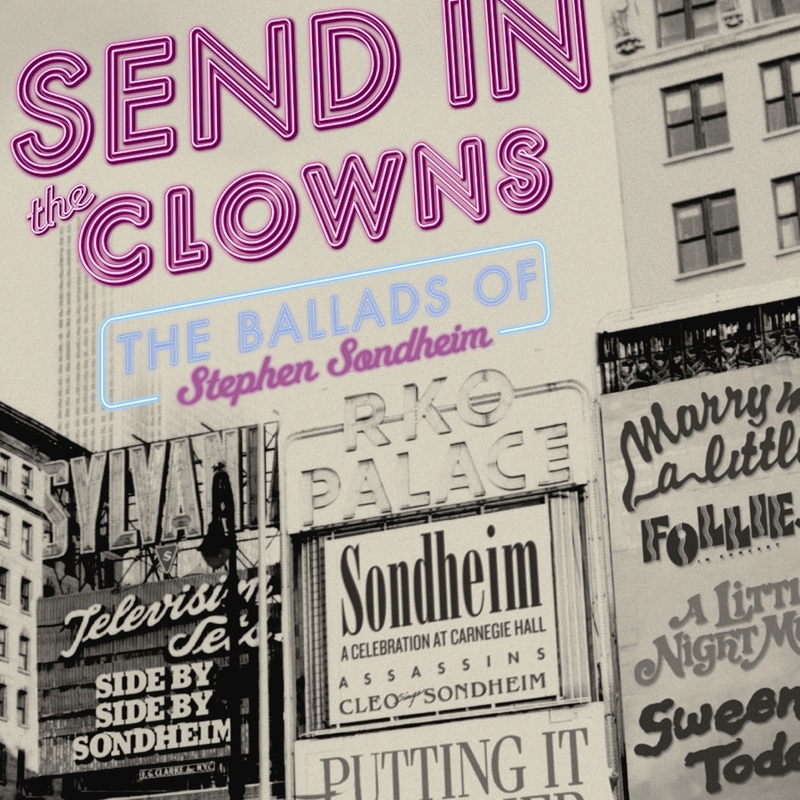 This compilation explores the tender side of Stephen Sondheim in ballads he’s written for some of his most popular musicals. It belies the composer’s unjust reputation for being unsentimental, and reveals a different facet of his musical personality. From the title track to songs like “Not a Day Goes By,” “With So Little To Be Sure Of,” “Too Many Mornings,” “In Buddy’s Eyes,” and “No One Is Alone,” this solid collection displays Sondheim at his most vulnerable and sensitive, in both original cast album and cover versions of these and many other songs from his catalog.